This vey old page is now replaced by a more user-friendly (hopefully) post on vegan food and accommodation in Hualien. 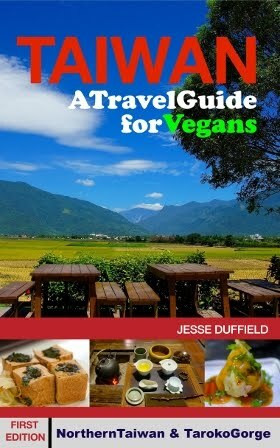 A complete guide for vegans to Hualien and Taroko Gorge (the four publicly accessible trails, not ones that require a permit application in advance) can be found in my Taiwan Travel Guide. Taiwan's mountains can be breathtaking, and are easily accessible in a weekend by car or scooter. So far all my posts have been on city-based attractions, however it should be highly recommended for any visitor for more than a day or two to get out of Taiwan's cities (which let's face it don't rival Venice or Kyoto for charm) and into the beautiful countryside. Sometimes Taiwan's cities made me want to escape into the mountains. With 23 million souls living in a country smaller than most provinces in other countries, it's easy to miss the fact that most of Taiwan is mountainous, and the first time I ventured up inland on my scooter for a long weekend I had no idea just how remote the centre of the island is, got hit by a typhoon and had quite an adventure, including a very long and very cold ride around the coast and back to Hsinchu. This typhoon set in very quickly. Adequately prepared, however, Taiwan's hinterlands offer breathtaking scenery, a range of climatic zones and a refreshing escape from the hustle and bustle of Taiwan's cities. I recommend taking extra warm clothes (year round), a full tank or even extra petrol, and a spare battery for a phone/GPS. My route back to Hsinchu from Puli, in the centre of Taiwan. According to my GPS navigation system, this was the most direct route. It probably wasn't the fastest, but it sure was beautiful. If you're travelling with a smartphone or netbook, you can access Wifly internet at all the 7-11s you'll pass along the way (if that doesn't defeat the purpose of the trip - at least it's useful to see where you are). Fortunately or unfortunately, you can never be too far from a 7-11, and increasingly (as in this case) a Starbucks. While scootering through the mountain range carries obvious risks, the mountains are very stunningly beautiful, and locals (often aboriginals) are always helpful and welcoming. Most aboriginal Taiwanese were converted to Christianity centuries ago, so churches (as opposed to temples) are a sign that one is entering an aboriginal village. Once after giving up riding through a typhoon I stayed in an old missionary's home which had been converted into a kind of inn. and some traditional Aboriginal artwork. Taroko Gorge, the country's top tourist attraction outside of Taipei, is about 25km from Hualien City, and an obvious destination for a trip from the populated East Coast across the island. Photos of stunning marble cliffs and other breathtaking scenery this gorge offers simply don't do justice to this scenic beauty, but do a better job than I possibly could trying to describe it here. It's a nice walk up to the bell tower atop this cliff, and a nice break from the busloads of (mostly Chinese) tourists. The cross-island highways are beautiful (and potentially dangerous, and sometimes closed due to snow or typhoon damage) but an easier, probably safer alternative route would be to take the high speed train to Kaohsiung and hire a car or scooter there, and then drive through Kenting National Park and up along the stunning East Coast to Hualien, either along the coastal Highway 11 or the more-inland Highway 9, or a combination of the two, but of course the vehicle will need to be returned to Kaohsiung. Alternatively, it's possible to take your own scooter on a train, but they are transported on separate trains at night, so you'll need to send it on in advance, or pick it up a day or two after you arrive. For fit, keen cyclists, it's also possible to take a bicycle on a train, but rather complicated, but details can be found on this Taiwan in Cycles blog. The sun sets over Taiwan's West Coast, a little south of Kaohsiung. Taroko Gorge has little in the way of public transport (unless you count all the buses of Chinese tourists) so it's best to have your own wheels there, so if you don't have the time or inclination to ride or drive to Hualien, the Taroko Express trains (Japanese tilting trains) can make it there from Taipei in two hours, making it so absurd that airlines still fly the route. If you have a local license (or apparently an international license) it's possible to hire a scooter in Hualien. A more comfortable option is to hire a taxi for a day to take you to where you want to go, stop for photos etc, but I personally like having a scooter for the independence it brings. 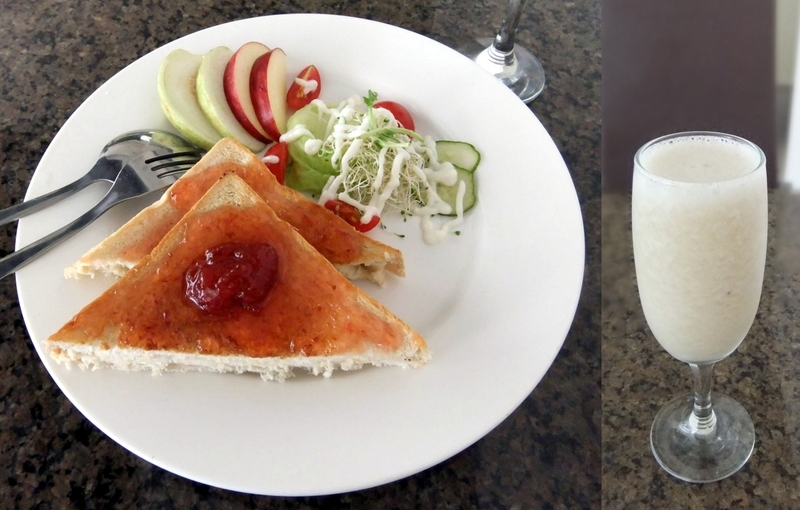 To see Taroko Gorge it's easiest to stay in Hualien, and why wouldn't you with one of the world's few vegan B&Bs there, namely the City Home. At 1600NT per double room, it's cheaper than most hotels in the city (which are generally either old and filthy or very expensive) and even aside from benefits of being all vegan, it's a much better deal than anything I've found in Hualien on previous visits. 2013 Update: The Loving Hut has closed, but the City Home is still operating as a vegan B&B. Rooms are large, spacious and immaculately clean, with a unique and charming interior style without being ostentatious. The City Home breakfast the next morning was simple but satisfying. Besides being a great deal accommodation-wise, and supporting a vegan business, the B&B also had a charming atmosphere. With only 8 rooms (half double and half for larger groups), it maintains a small and cozy feel, with staff (mostly students on summer vacation while I was there, which has the added benefit for foreigners that they speak English) usually talking in the foyer, and more sometimes coming over from the restaurant for breaks. With card access to rooms and the main door, it also felt very secure. If you plan on staying at the City Home during weekends or any time during the summer vacation, be sure to book ahead (there should always be an English speaker on) as they are generally fully booked out at peak times. It's about 2km from the train station, so you'll need to take a taxi if you have luggage. Make sure you have the address written down in Chinese first, as taxi drivers won't know it (in English at least!). Also note that Google Maps show the same building before it was transformed into the LH/City Home. City Home was originally a Loving Hut as well, but it closed this aspect of the business and is now just a B&B, however only 2km away is another Loving Hut, open 6:30 - 2:00 Mon-Thu and 6:30 - 8:30 Fri-Sun. Other than Taroko Gorge I'm not aware of a lot else to see or do in Hualien, but of course see a travel guide for more ideas. Beware that the Farglory Ocean Park, seen by many as Hualien's second attraction after Taroko Gorge, (ab)uses dolphins.